Staying the night before your holiday in a London City airport hotel neednt be expensive. Book with HolidayExtras.com® and youll be sure to find an affordable deal. When you pre-book online with HolidayExtras.com, you could save up to 40 per cent on the standard room price. With our Best Price Guarantee you can be confident you're getting the best price possible. We also always advise booking your overnight hotel stay at the airport once you have booked your holiday because youll guarantee yourself the room of your choice at a great price. What hotels do you have at London City airport? 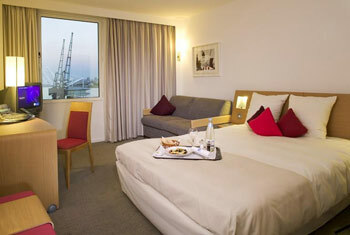 The hotel we offer at London City airport is the 4-star Novotel. Located only 2.3 miles away from the airport, the hotel provides 24-hour transfers that take ten minutes on a request basis. The Novotel London is opposite the Excel exhibition centre, located in the Docklands and is also near Canary Wharf, O2 arena, Greenwich and Stratford. The hotels bar is open from 11am to 1am and the brasserie-style Upper Deck restaurant is open from 6am to midnight, serving delicious meals. 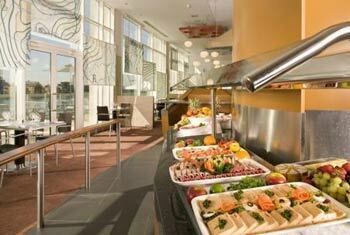 Room service is available 24-hours a day and a hearty English breakfast is included so you can fill up before you fly. Facilities at the hotel include a sauna, a hammam and a fitness centre, which you can use at your leisure. The FairFX pre-paid currency card works just like your debit card and you can use it to pay for things anywhere in the world. There are no transaction fees and a competitive cash withdrawal charge. Your card comes pre-loaded with your chosen currency and is easy to top-up online. This card is usually £10, but its free with HolidayExtras.com.